It’s no fun to paint on a windy day. The paper dries too fast and the easel is always threatening to topple over. That’s why I went up to Gully Point Cove in Rockport early in the morning while the sea was relatively calm. As I painted, the wind slowly picked up until I had to hold the easel down with my free hand. So absorbed was I in trying to complete the painting that I didn’t notice a crowd gathering nearby, hands shielding their eyes, staring and pointing out to sea. When I looked out to see what the commotion was, I witnessed a dramatic kayak rescue. Later in the day I met the young man who had to be picked up by the coast guard boat and I was relieved to find out that he was fine. I guess it’s no fun to kayak on a windy day either. Love seeing your sketches everyday. How long does each sketch typically take? And thanks again for sharing with us. Glad you like them Elizabeth. Thanks for letting me know. Typically each sketch takes anywhere from 30 to 60 minutes. Of course some of the things I post are paintings and they take about two hours. Lovely, lovely! Glad you were out on the water. That should read “weren’t” out on the water!! I’m glad too. The poor kid from the kayak rescue looked pretty shaken up. He had turned around to check on how his girlfriend was doing in her kayak and got hit with a rogue wave!! Thanks Les! 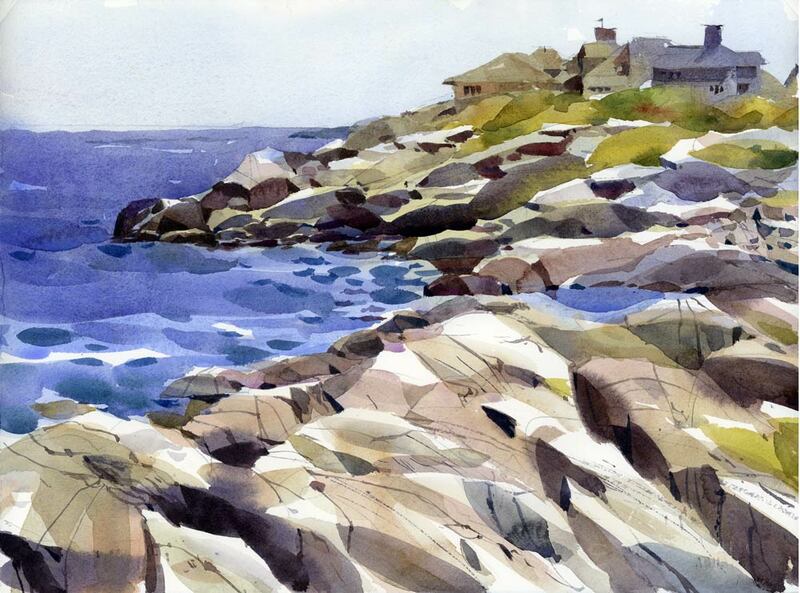 There is such a large and talented art community in Rockport. I think residents are so used to painters on the side of the road they never even glance at them. Very glad the kayaker is all right. Your paintings/sketches gorgeous a sever. – Justcurious; are you in Rockport, Massachusets or Maine? Thanks Kristiina. This is in Massachusetts.